We’d love your help. Let us know what’s wrong with this preview of The Ruins of Lace by Iris Anthony. pulling soldier and courtier alike into its web. For those who want the best, Flemish lace is the only choice, an exquisite perfection of thread and air. For those who want something they don’t have, Flemish lace can buy Lace is a thing like hope. To ask other readers questions about The Ruins of Lace, please sign up. You know the saying, too many books, too little time? It sums up my dilemma perfectly. Sometimes it’s a choice between fiction and the many books on historical events I want to read by year’s end. Lucky for me I got the best of both worlds in The Ruins of Lace. It’s a fascinating read and shows how much work and effort the author took in researching the topic of lace and its impact on culture and society in 16th century France. What made it all the more captivating was the author decided to tell this story from lots of viewpoints and how lace, its production, and the need to own it, affected people’s life. I also enjoyed, and excuse the pun, how all these individual’s stories became woven together as the book progressed. All the characters were well-rounded, and the dialogue natural sounding. You might think a book of this length and subject matter would be slow paced, but this one was anything but. I found myself carrying it with me and was compelled to read what happened next at any chance I got. I will definitely be looking for more books by Iris Anthony. If you’re looking to read something a little different this fall, I highly recommend this one. This was news to me, that there was a time in French history when lace was contraband. To possess it was a criminal act and to smuggle it into the country was treasonous. Whenever someone with means wants something they can’t readily have, there is always someone who will get it for them for a price, regardless of the risk or who they have to abuse and use to get it. Told in multiple view points, including that of a dog who is a smuggler’s runner, it is obvious the story is really about people – This was news to me, that there was a time in French history when lace was contraband. To possess it was a criminal act and to smuggle it into the country was treasonous. Whenever someone with means wants something they can’t readily have, there is always someone who will get it for them for a price, regardless of the risk or who they have to abuse and use to get it. Told in multiple view points, including that of a dog who is a smuggler’s runner, it is obvious the story is really about people – and a dog – and what they value most in life and what they are willing to do or suffer to have it. I was especially intrigued by the notion that what makes lace beautiful is the part that isn’t there – the air between the threads that creates the pattern – that is the part that gives lace its artistry; the invisible part. That is remarkable to me and worthy of pondering. The story is told from the viewpoint of 7 characters in alternating chapters. It's just too many voices and the chapters overlap in odd ways at times. I've read a lot of books from multiple POV and even for the best writers maintaing 3-4 characters is difficult, maintaining 7 and keeping your reader interested ESPECIALLY in a book under 320 pages is impossible. This unfortunate choice flawed the book. At most 3 of the characters were needed to tell the story and there are 2 that are completely i The story is told from the viewpoint of 7 characters in alternating chapters. It's just too many voices and the chapters overlap in odd ways at times. I've read a lot of books from multiple POV and even for the best writers maintaing 3-4 characters is difficult, maintaining 7 and keeping your reader interested ESPECIALLY in a book under 320 pages is impossible. This unfortunate choice flawed the book. At most 3 of the characters were needed to tell the story and there are 2 that are completely irrelevant. Katharina has spent her whole life making lace. It is the only thing she knows. Without it, she will be lost. This is why; Katharina can not let the nuns know that she is almost blind. Because if the nuns where to learns Katharina’s secret then Katharina would be thrown out on the streets. Lisette is in love. Although, Lisette is about to learn the true cost of love. The Count is obsessed with lace. He wants it and will do anything in his powers to get it. I have had a history with historical an Katharina has spent her whole life making lace. It is the only thing she knows. Without it, she will be lost. This is why; Katharina can not let the nuns know that she is almost blind. Because if the nuns where to learns Katharina’s secret then Katharina would be thrown out on the streets. I have had a history with historical and historical romance novels. On one hand, I enjoy reading about the history of the story that I am reading and if done right the romance can help between the two characters however; on the other hand after a while, I grow bored of the history and details. I am happy to report that was not the case at all with this book. Instantly, I was attracted to the characters. They had heart, depth, and made you feel for them. Each character had their own voice. It was intriguing to read how important lace was to each of them and how it affected them as well. While, I have never owned an exquisite piece of lace, after reading this book, I will not look at it again the same way. All the history, hours, and labor of love spent in making a piece of lace is amazing. The love story in this book is a tragic one. The Ruins of Lace is a book to be treasured! This is another of Casey's suggestions. I really liked this book. It was full of complicated moral dilemmas. Decisions had huge consequences that affected everyone in the wake. Each of the 7 characters had a sympathetic back story, even the antagonist. Favorite quotes come from a bit player, Denis, a failed baker's son turned failed soldier, who chooses to return to his home village after finally deciding to exchange his gun for a loaf of bread. "Now I understood everything. The lieutenant had th This is another of Casey's suggestions. I really liked this book. It was full of complicated moral dilemmas. Decisions had huge consequences that affected everyone in the wake. Each of the 7 characters had a sympathetic back story, even the antagonist. Favorite quotes come from a bit player, Denis, a failed baker's son turned failed soldier, who chooses to return to his home village after finally deciding to exchange his gun for a loaf of bread. A fascinating look into a part of history we don’t usually see represented in fiction, this book will captivate any lover of historical fiction. The most exciting part of this book is the careful melding of multiple storylines. This is never an easy thing for an author to achieve and even less so when dealing with a period in time so far removed from our own. The author is very clever in handling the many plot lines, making them straight-forward enough so that they don’t knot with one another. I A fascinating look into a part of history we don’t usually see represented in fiction, this book will captivate any lover of historical fiction. The most exciting part of this book is the careful melding of multiple storylines. This is never an easy thing for an author to achieve and even less so when dealing with a period in time so far removed from our own. The author is very clever in handling the many plot lines, making them straight-forward enough so that they don’t knot with one another. I do wish some of the characters’ lives had been resolved a bit more than they were, however, because the author leaves one or two of them dangling. The writing is beautiful. It’s by turns lush and sparse, modeling after the lace one of the characters shapes with her bobbins. I do have to warn, though, about one of the storylines, which is told through a dog’s eyes who lives through abuse. As an absolute animal lover, this was almost impossible for me to read, so if you have a sensitivity towards reading about animal abuse, I’d caution you to pick out another book. I hate to tell people not to read a particular novel, but it really was a hard few chapters following the dog’s journey. Other than that, though, I do think this book is worth reading. If you’re interested, look for it in October. "Lace is a thing like hope. It was never meant to destroy so many lives . pulling soldier and courtier alike into its web. For those who want the best, Flemish lace is the only choice, an exquisite perfection of thread and air. For those who want something they don’t have, Flemish lace can buy almost anything––or anyone." I just finished this most superb of novels and I am simply amazed at how truly affecting it is. "Lace is a thing like hope. I just finished this most superb of novels and I am simply amazed at how truly affecting it is. Iris Anthony has created an experience as much as a novel. Truly amazing historical fiction on a topic not previous covered in the genre...riveting and very very emotionally gripping!!! The novel is about 17th Century France and King Louis the Just and his edict outlawing the smuggling of lace from Flanders. Lace was forbidden to be worn as those who purchased it had to buy it from abroad, thereby depleting the King's Coffers. The novel is divided between several key characters, those who make the lace, those who desire it and those who are affected by it. Ms. Anthony has researched her subject well, she started the book in 2002 and after many re-writes has produced a treasure. This is a book that evokes deep emotions on many fronts. The orphan girls who labor in horrific conditions in convents making lace, going blind and deformed in the process is truly hard to read, yet it is true and must be acknowledged. The main plot involves a young girl who spoils a length of lace and the enormous consequences that simple mistake has for so many. The writing is so very spot on that one finds it hard to put down. Each chapter is written in the first person by character involved and allows a range of views. This is a very facinating and absorbing story. One of the characters who is featured, and who dictates several chapters is "The Dog". One might think this would seem contrived. It is anything but, his chapters are among the most heartbreaking. Dogs were widely used to smuggle lace..the methods were horrific..as the book explains. The use of the dog's narrative gives voice to the over 40,000 dogs that were killed during this period by bounty hunters trying to keep lace from being smuggled into France. I cannot recommend THE RUINS OF LACE more, it is as unforgetable a book as you are likely to read. While a small part of history, under the perfect pen of Iris Anthony it comes alive in a most vivid and riveting manner. A strange and compelling read. Each chapter is from a different point of view - including that of a dog! The thread (pun intended) that unites all the disparate stories in a unified whole is 'lace'. In fact, 'lace' almost seems to be a character in this book, as the repeating cycle of perspectives twist and turn so that - at last - the pattern is apparent. Is there any central character? Not really. Is there a hero? Yes. A villain? Yes. A romance? In parts. A thriller? In parts. A crime novel? In A strange and compelling read. Each chapter is from a different point of view - including that of a dog! The thread (pun intended) that unites all the disparate stories in a unified whole is 'lace'. In fact, 'lace' almost seems to be a character in this book, as the repeating cycle of perspectives twist and turn so that - at last - the pattern is apparent. Is there any central character? Not really. Is there a hero? Yes. A villain? Yes. A romance? In parts. A thriller? In parts. A crime novel? In parts. An historical adventure? In parts. Gothic horror? In parts. HEA? Well, certainly for the dog. Such a different, different story it almost defies description. The blurb cites a review saying it's the story of 'two women bound to the cruelty and beauty of forbidden perfection.' Hmmm. I'm glad they said that because, although the women, Katarina of Flanders and Lisette of France, were amazing characters (who never meet in the story), I have to say the ones I remember most are two men. The first is Alexandre Lefort, willing to sacrifice his honour to save the woman he loves as well as her father - the man who rescued him from beggary after his own father died of leprosy. The second is the border guard Denis Boulanger, a man who fails at his chance of freedom - and then has to choose between honour and conscience. THE RUINS OF LACE by Iris Anthony is a complex and intriguing historical fiction set in 17th century France and Flanders. It is a complicated story of freedom,the fascination of lace,lace makers, the rise and fall of an empire,homosexuality in the 16-17th century in France, and cost to lace makers. “The Ruins of Lace” is a story written with vivid descriptions,detailing the intricate making of lace,the cost to the lace makers,and the lost of so much. It interweaves between the cast of characters,each with their own story to tell and the tragedy that befalls them. So much destruction and lost due to lace and the people who so crave the contraband,with betrayal,greed,secrets,and the forbidden lace. An interesting story for anyone who enjoys 17th century France, lace making,and historical fiction. I found this story full of twists and turns as the characters maneuver through the intricate times of contraband lace and the people who would do anything for gain. Received for an honest review from the publisher. Details can be found at the author’s website,Sourcebooks,Inc, Sourcebooks Landmark and My Book Addiction and More/My Book Addiction Reviews. When I first began this book, I thought to be reading a simple, possibly frilly book about the back-alley lace trade in late 1600's France and Flanders. Imagine my surprise when the story is told from the alternating, first-person points of view of seven different players, one of whom is so improbable, I just did not know how it could possibly flow. But flow it did! From the almost blind, convent-bound lace-maker who will soon be turned out, to an evil gender-confused Count who believes contraban When I first began this book, I thought to be reading a simple, possibly frilly book about the back-alley lace trade in late 1600's France and Flanders. Imagine my surprise when the story is told from the alternating, first-person points of view of seven different players, one of whom is so improbable, I just did not know how it could possibly flow. This is one of the most satisfying stories I have read in some time. There was nothing frilly about this book, nothing fragile and demure. It was fast-paced, and held no punches. So.Many. Narrators. Honestly, I usually quite like hearing the story from more than one first person narrator. But this one has so many narrators, I can't even be bothered to go back and count. And one of these narrators is a dog. Under some circumstances, that would be ok. However, this book doesn't really lend itself to whimsy. It's actually rather dark and depressing so the dog narrating issue just jars the reader. It's a distraction to the story line and really adds nothing you couldn't figu So.Many. Narrators. Honestly, I usually quite like hearing the story from more than one first person narrator. But this one has so many narrators, I can't even be bothered to go back and count. And one of these narrators is a dog. Under some circumstances, that would be ok. However, this book doesn't really lend itself to whimsy. It's actually rather dark and depressing so the dog narrating issue just jars the reader. It's a distraction to the story line and really adds nothing you couldn't figure out anyway. This book veered in a different direction than I had expected, though I wasn't sure I enjoyed where I was taken. A story that revolves entirely around lace risked being boring, and although it didn't reach the great scopes I thought it would it did manage to sustain some of my interest. I didn't like how there were so many viewpoints to keep track of, though - I confused so many of them. And having them happen in sequence, one picking up where the other left off, felt unpleasant even though it sh This book veered in a different direction than I had expected, though I wasn't sure I enjoyed where I was taken. A story that revolves entirely around lace risked being boring, and although it didn't reach the great scopes I thought it would it did manage to sustain some of my interest. I didn't like how there were so many viewpoints to keep track of, though - I confused so many of them. And having them happen in sequence, one picking up where the other left off, felt unpleasant even though it shouldn't have been that way - perhaps I felt like some scenes didn't need to follow so soon after. On the subject of unnecessary, I often wondered how relevant some of the characters and viewpoints were. Moncher's felt the most pointless, and the two sisters were boring and not particularly linked to the others in a relevant or satisfying way. I also didn't care for some of the goals even if the characters were sympathetic, and I could see where they were going to intersect far ahead of what would've been a satisfying discovery. I hated the ending, too - especially the last chapter of each viewpoint where it didn't feel like the end of their story at all. There wasn't a flow that felt like it was heading to the end, either - the closer I got to the end, the more I feared that there would be another book afterwards. What happened in the end, too, was terrible. Many of the characters had unsatisfactory outcomes (especially the deaths involved), and I would've wished it otherwise. The only character I particularly wanted to succeed, and was interested in the most, was the Count. Although, and perhaps it was because I wasn't paying too much attention, I would've liked a more obvious statement as to what was "wrong" with him to begin with instead of being left with the wonder of what could be keeping him from getting what he wanted. I suspected many times that he was a woman crossdressing or that he was both sexes, so to find out otherwise (view spoiler)[ that he had syphilis and that his mother "trained" him to be a woman" (hide spoiler)] made sense but felt too late by that point. His interactions with Remy were interesting and confusing at the same time (which was another thing that made me second-guess everything about him), and I would've preferred some more obvious hints as opposed to the veiled speech and narration involved in his story to clarify that and his proper identity. It's a shame how he ended up, because I would've preferred his success above all. This novel was a very refreshing piece of historical fiction. The topic, the black market for lace in 17th century France, is one that I have not seen around before and was eager to read about. Anthony did not let me down and I was treated to quite the entertaining read. As you move through this book we alternate narrators – we have: a lacemaker, a family whose life is ruined by a careless mistake made to a piece of lace, a dog who is used to smuggle lace, a guard of the boarder who is supposed t This novel was a very refreshing piece of historical fiction. The topic, the black market for lace in 17th century France, is one that I have not seen around before and was eager to read about. Anthony did not let me down and I was treated to quite the entertaining read. As you move through this book we alternate narrators – we have: a lacemaker, a family whose life is ruined by a careless mistake made to a piece of lace, a dog who is used to smuggle lace, a guard of the boarder who is supposed to prevent lace smuggling, and a man who is desperate for lace (I think I hit them all…). Each of these characters lives show you a different part of the lace industry from the crafting, to the smuggling, to the purchasing. There also is enough history of why all the smuggling was happening to give the reader enough background to feel fully knowledgeable of what is happening. The story is fast paced with action of every page right from beginning to end. It reminded me of an American Prohibition time period novel the way everything was black market, dangerous, smuggled, and very lucrative or disastrous depending on which side you ended up on. The characters were captivating, both the good and the bad, and all had flaws – which was rather refreshing. I kept wondering how she would write a chapter from the dog’s perspective, and I thought it was pulled off rather well. She keeps it within the limited scope of what a dog might actually understand, not having the dog think like a human. He was probably my favorite character and must have been a challenge to write! My opinion of the ending has changed a little. When I first finished the book I thought that it was a little open ended and reminiscent of a “pick-your-own ending”. This frustrated me a little, but then I made up my own idea and was happy with my version of the ending. However, I just read a post on the author’s website where she tries to help clear up the ending with a clever scavenger hunt of pages from the book. Here is the link to that post [http://www.irisanthony.com/1/post/201...] so if you have finished the book and want to figure out what she intended you can. It helped me out. She will also be guest posting at Mod Podge Books on the 22nd discussing more about the ending. The authors note and extended discussion with the author about the history behind the book was phenomenal and I really appreciated learning more about it – it really brings the chapters from the dog perspective home. Written in the points of view of seven people whose lives enmeshed each others’ all in the pursuit of their quest for lace: Alexandre wo Who would have known that in the 17th c. a sheer piece of lace-delicate and intricately woven was preciously coveted, priceless and forbidden by law and the French king himself? The Ruins of Lace is a novel based on all the sacrifice, crimes, smuggling, corruption and the unimaginably wild extent that people went to obtain even the smallest piece of this craft. The Ruins of Lace is a turn from what I generally read (romance), but this book piqued my interest and I had to give it a try. With a cast of divergent characters in various levels of social standing, all united by forbidden lace, Iris Anthony has weaved together an intricate and intelligent novel. There is so much to The Ruins of Lace that makes it a unique novel. The story is told from multiple viewpoints and characters who seemingly have little to do with each other. The central theme is lace, a very special, high quality, much-coveted lace that has been forbidden in France. Certain people and characters will do just about anything to obtain the lucrative lace, and for some of the characters in this book, the lace is their downfall. Because of the multiple viewpoints and characters, the pacing is quite slow, especially in the beginning. The characters are slowly introduced and their connections to other characters is not clear. As the story progresses, threads begin to connect and the story pieces together. So, despite the slow nature, as the story came together, I found myself really enjoying the book. I appreciate how intricate this book is, and how the story parallels the lace that is central to the novel. This book is one that left me thinking. When I finished the last page, I was unsure how I felt about what I had just read. I enjoyed the story and how everything pieced together, but I felt that there were a few threads left open. I think that the author may have intended this type of ending to let readers draw their own conclusions, but I would have liked a bit more completeness. As I said, I am used to reading romance books, and I like my endings to have definite conclusions. However, I will say that overall, I was very pleased with this book. 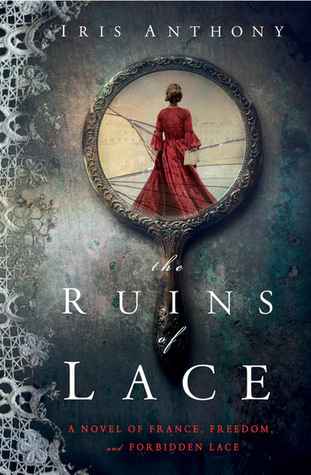 I like branching out from my go-to genre on occasion, and I was not disappointed with The Ruins of Lace. I read this book for a book club. The story is told from different first-person perspectives. Each of these people, and one dog, are affected by the ban on the importation of lace by King Louis XIII. The setting is the first half of the seventeenth century in France and Flanders. While this might seem a dull subject, one has to remember that banning lace meant that there was a black market and hence smuggling. How lace was smuggled will shock you. The dog's story is very difficult to read. The ab I read this book for a book club. The dog's story is very difficult to read. The abuse is horrific. I give credit to the author for not sugar-coating how awful this abuse was. This also goes for the lacemakers, as well, who went blind and then were dumped when that happened. They often were victimized by men in the most horrible ways. I was a little ambivalent about the character of the Count. He is portrayed as having been forced to live as a girl for the 1st 7 years of his life by his mother. Now as an adult he engages in homosexual relations. But the earlier psychological damage committed by his mother and father have made his sexual life unfulfilling. He considers himself depraved. My ambivalence arises because as the only homosexual main character, he is the villain. In his case, is his homosexuality innate or the result of the sexual confusion caused by his earlier trauma? Of course I don't think that all homosexual characters should be portrayed as saints, so I am not making that claim. I understand as well that certain characters are going to be repulsed by his behavior so I also do not object to that in particular. I guess that my question is what is the author's viewpoint about this character's homosexuality. At least it makes for interesting discussion. In the seventeenth and eighteenth century, lace was a most precious commodity in France. Frequently made in the abbeys of the Netherlands, the stuff was smuggled into France by the most ingenious and cruel means. Dogs used to smuggle lace were used and abused in the most despicable of ways. Corpses were frequently used to smuggle the lace as well. The hands that created the lace belonged to children of poor families.Because the lace was s delicate and needed to be kept snow white, these childre In the seventeenth and eighteenth century, lace was a most precious commodity in France. Frequently made in the abbeys of the Netherlands, the stuff was smuggled into France by the most ingenious and cruel means. Dogs used to smuggle lace were used and abused in the most despicable of ways. Corpses were frequently used to smuggle the lace as well. The hands that created the lace belonged to children of poor families.Because the lace was s delicate and needed to be kept snow white, these children sat hunched over pillows in towers, in the dark, their room heated only by the heat generated by the animals housed below them. Their fingers became gnarled and deformed by arthritis, their spines became permanently bent over as time went by.The nuns that taught them to tat(the process of making the lace) were frequently cruel in their teaching methods. Once the lace makers went blind or were otherwise unable to complete their task, they were summarily dismissed, thrown out of the gate to be at the mercy of the public. More often than not, this meant being raped and thrown into prostitution. The Ruins of Lace tells this story using the voices of seven characters, six of whom are human.The story line is tragic and so sad. Like a seeing a train wreck in progress, the reader had to keep reading to see what would come next. I cannot honestly say that I enjoyed this book. I alternated between anger and revulsion through most of the book. But there is a moral thread that weaves throughout the story. That of self worth and worth in general. The reader is asked to define and at times challenge their view of worth.What makes something/someone worthy or unworthy. And I took away new knowledge of history.And that for me made the reading of this book worth it. - A beautiful cover and a fascinating topic. - Although some readers have complained about the structure or the alternating perspectives, I found this aspect of the book worked. It fit with the overall arc of the narrative. - What didn't work for me was the lack of character depth. - I'm not sure it had anything to do with the number of characters; but likely more to do with the author's handling of her multiple characters. - For one, when you are writing in the 1st person, the author should lose th - A beautiful cover and a fascinating topic. - For one, when you are writing in the 1st person, the author should lose their own voice and change it into that character's 1st person persona. In this book, (with the exception of a few minor occurrences), all of the characters sounded similar. However, this is not just a problem specific to this book; many well-known books suffer from this same problem. - But because of the lack of character depth, I found it difficult to understand or empathize with any of the characters. For instance, Katharina was just seemed guileless to the point of stupidity, Lisette's guilt starting to become irritating and Alexandre's intense sense for "honor" and retribution seemed rather foolish at times. - The ending by far, was the worst. Anti-climactic and along the lines of a cheesy action movie. My history was a little bit rusty. I had no idea that lace had been outlawed in France in the 1600s. The Ruins of Lace was a little bit of a history lesson for me. The one thing the book didn't really explain was WHY lace had been outlawed. A little bit of internet exploration gave me the answer. Bottom line, it had to do with only having nobility showing off their wealth and no one else. Google Sumtuary Laws for more explanations and other places where lace was outlawed, including the early Ame My history was a little bit rusty. I had no idea that lace had been outlawed in France in the 1600s. The Ruins of Lace was a little bit of a history lesson for me. The one thing the book didn't really explain was WHY lace had been outlawed. A little bit of internet exploration gave me the answer. Bottom line, it had to do with only having nobility showing off their wealth and no one else. Google Sumtuary Laws for more explanations and other places where lace was outlawed, including the early American Colonies. On to this particular book, The Ruins of Lace is told from many viewpoints, from the people wanting the lace, to the lacemaker, to the lace smugglers. At times I felt like there were too many viewpoints and storylines to keep track of, but it really did help give an overall picture of what was really going on at the time. My favorite character and viewpoint was the dog. I loved that idea of telling the story from the eyes of the lace smuggling dog. As a somewhat crafty person, I could really appreciate the craft of lacemaking and my heart really went out to the lacemakers. Their conditions as described in the book must have been madness inducing. However, reading the book also made me want to look into how to make Flemish Bobbin Lace. I really liked this story and I think it will appeal to a large audience. I'll definitely be recommending this book to the historical fiction fans and the needleworkers in my life. "It had been two months now." Interesting book with eight different view points, including a smuggling dog. Lace is illegal and worth more now than ever. Used as bribery, smuggled into France and made by nuns, Flemish lace is precious. I really liked all the different points of view and how they came together in the end. I'm not sure I liked or understood the ending. But the journey was intriguing. I had a hard time putting the book (ereader) down. The book starts with a nun who is a lacemaker; her sister wants to buy her freedom; a soldier is charged with finding illegal lace but is an idiot; a desperate boy whose love is taken in exchange for lace; the count who needs the lace; the dog who carries the lace. And that's not all! The story is as intricate and woven and tight as the Flemish lace that has so many lives and dreams riding on it. An interesting time in history that I hadn't ever heard about. Very interesting! Our story starts with two sisters – Katharina, who is a lacemaker at the Flemish abbey of Lendelmolen; the other, Heilwich, who is a housekeeper of sorts to a nearby priest. Both stories are presented in the first person narrative. As intricate as the pattern of the lace, the other voices are added to the story - Denis, a border guard whose job it is to seek out the smugglers; a dog used for smuggling; Lisette, a young girl who has fallen under the spell of lace; Alexandre, a young man with no fu Our story starts with two sisters – Katharina, who is a lacemaker at the Flemish abbey of Lendelmolen; the other, Heilwich, who is a housekeeper of sorts to a nearby priest. Both stories are presented in the first person narrative. As intricate as the pattern of the lace, the other voices are added to the story - Denis, a border guard whose job it is to seek out the smugglers; a dog used for smuggling; Lisette, a young girl who has fallen under the spell of lace; Alexandre, a young man with no future of his own who seeks redemption and honour; and a wily, scheming count who hopes to use this precious gift as a bribe to secure his own financial future. As one by one the characters meet and their stories merge, we are drawn along on the journey – will the prized lace be secured in time to prevent the dishonor of one – or will our young hero fail in his task. The reader will be held spellbound until the final chapters reveal all – and the pattern is complete. While a novel based on historic details outlining the gruesomely bizarre method of smuggling lace in 18th Century France represents a fascinating premise, Iris Anthony's handling of it was awkward and comical in all the wrong places. The seven alternating points of view should have added to the suspense and pacing, yet the poorly developed voices of the individuals (including a dog's) merely emphasized the clumsiness of interactions between characters. Besides a lame interspersing of a few Frenc While a novel based on historic details outlining the gruesomely bizarre method of smuggling lace in 18th Century France represents a fascinating premise, Iris Anthony's handling of it was awkward and comical in all the wrong places. The seven alternating points of view should have added to the suspense and pacing, yet the poorly developed voices of the individuals (including a dog's) merely emphasized the clumsiness of interactions between characters. Prior to coming across The Ruins of Lace by Iris Anthony, I never had any idea that lace was once contraband anywhere – let alone in France! I still find myself wondering exactly why a king would care about something so frivolous. But, I digress. The story is told in first-person by several different characters. The reader always knows who’s talking. Each chapter is titled after the name of the speaker, and each speaker has a distinct voice. Plus, circumstances are different enough through most o Prior to coming across The Ruins of Lace by Iris Anthony, I never had any idea that lace was once contraband anywhere – let alone in France! I still find myself wondering exactly why a king would care about something so frivolous. But, I digress. The story is told in first-person by several different characters. The reader always knows who’s talking. Each chapter is titled after the name of the speaker, and each speaker has a distinct voice. Plus, circumstances are different enough through most of the story lines that it’s just that much easier to keep them straight. The hardest one for me to read was the dog’s perspective. Yes, the dog. Apparently, dogs were commonly used by lace smugglers, and their treatment was just atrocious! And, yes, the reader is made fully aware of just how atrocious it was for those poor animals! Setting aside the question of whether this book is long enough to adequately develop 7 different POV characters, I was a bit puzzled by the consistently YA writing level/style, considering the varying ages of the 6 human characters (plus 1 dog), who range from young adult to 30something at least. I can appreciate the way that the different perspectives wove together -- like lace, as the author points out in a somewhat grandiose foreword. The subject matter is indeed interesting, though I'd have l Setting aside the question of whether this book is long enough to adequately develop 7 different POV characters, I was a bit puzzled by the consistently YA writing level/style, considering the varying ages of the 6 human characters (plus 1 dog), who range from young adult to 30something at least. I can appreciate the way that the different perspectives wove together -- like lace, as the author points out in a somewhat grandiose foreword. The subject matter is indeed interesting, though I'd have liked a lot more historical/background information than what I got here. My biggest issue actually turned out to be this: WHAT was with the "evil gay character" BS? Okay, one of your POV's is a dude that's kind of evil. But apparently that's because he was made to cross-dress as a child, and he hates women but wants to be one, and trans* equals gay, and that's why he's evil? No. Just, no. During the reign of King Louis XIII, lace was banned in France. The story of six people and one dog and the importance of lace in their lives during this time is told in alternating chapters beginning with Katharina. At 30 years of age Katharina is the best and oldest lacemaker in a convent. She is practically blind and sits hunched over. Her older sister wishes to buy her freedom but the head nun won't giver her up. When the nuns find out Katharina will be kicked out of the convent and fated to During the reign of King Louis XIII, lace was banned in France. The story of six people and one dog and the importance of lace in their lives during this time is told in alternating chapters beginning with Katharina. At 30 years of age Katharina is the best and oldest lacemaker in a convent. She is practically blind and sits hunched over. Her older sister wishes to buy her freedom but the head nun won't giver her up. When the nuns find out Katharina will be kicked out of the convent and fated to become a prostitute as all the past lacemakers have become. As a child, the Count stayed at Lisette's home. She snuck into his room to spy and found some beautiful lace that she soiled. Her father has to pay the Count back an absurb sum due to the increased value of the forbidden lace. Will lace be the ruin of these mostly humble characters or the salvation?